The wide array of scuba diving equipment available is often bewildering to a novice diver. Some items are essential in all circumstances, while others are used only in specific scuba diving environments. The more research you do and advice you seek, the more likely you are to buy safe, suitable gear. You could begin your scuba diving training with as little as a swimsuit, but it may be advisable to at least obtain a good-quality mask, snorkel, and fins. This means that you always have three key pieces of gear that fit perfectly, and with which you are comfortable. 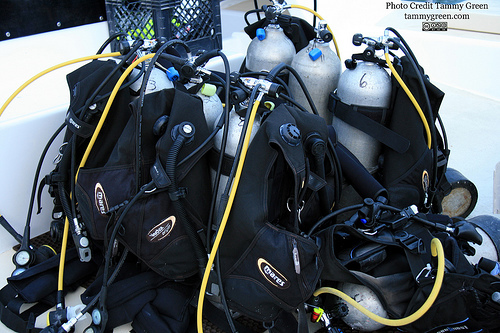 Many divers own no more than this basic scuba diving equipment, preferring to rent the rest. There are pros and cons to this approach: it frees you from carrying heavy gear around, but it can also mean using ill-fitting equipment that has been worn by many people, and which may not have been well cared for. The alternative is to buy and transport all your own gear. This is recommended if you are likely to be diving regularly in your local area (although a local club or shop may have gear you can rent). It is not so practical if you plan to dive any farther afield—taking your own gear overseas can be expensive, although most dive tour operators are fairly generous with their excess baggage allowances. You can rent a tank and weights from any dive center, so you need never travel with these items. The best places to buy scuba diving equipment and obtain advice are dive shows or local dive shops. Second-hand gear is worth investigating, but inspect it for signs of wear and corrosion before-making a purchase, and make sure that it is serviced before use. If you are already in the know about the exact equipment you need and your size you may also wish to purchase it online. There are several items of scuba diving equipment that are essential, in addition to your mask, fins, and snorkel. A buoyancy compensator device (BCD) is an inflatable jacket that keeps you afloat at the surface, helps you adjust your buoyancy underwater, and supports other vital pieces of equipment. Weights and a belt to mount them on are another necessity although weights can also be carried on some BCDs. You will also need some kind of dive suit depending on the water temperature—and boots. A regulator (the device that supplies air to the diver) is also necessary, preferably one that incorporates an alternative air source (an octopus) and an instrument console with a compass. Dive computers are a useful aid to safe diving, and you should also carry a knife to cut yourself free if you become snagged underwater. There is a range of scuba diving equipment and accessory items designed for specialized diving. Try to borrow or rent specialty gear that you may only use infrequently. Slates are useful accessories, since they allow you to write messages to your buddy, or to make notes from your dive—for example, on species that you do not recognize- or to sketch a site. Flashlights are essential for diving at night, in murky water, and in low-light environments, such as caverns and wrecks. If you will be doing a lot of open-water diving, especially in currents, you should purchase a marker buoy, either a surface marker buoy (SMB) or an inflatable surface marker buoy. These indicate your position to observers on the surface, and also aid your ascent. Lastly, you may wish to record your dive experiences with an underwater dive camera. Digital cameras in housings are now small enough to fit into pockets in your kit. There you have it, a basic guide to scuba diving equipment. Most of all make sure you take your smile and have fun! 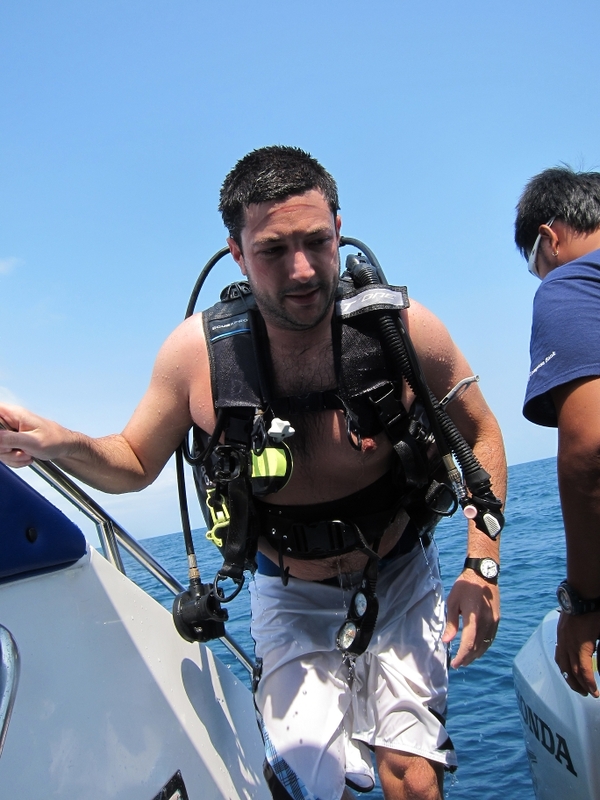 This entry was posted in Scuba Diving, Water Sports and tagged Scuba Diving, Scuba Diving Equipment. Bookmark the permalink.